STAFF at Ipswich Hospital are caring for the community both inside and outside the walls of the hospital this festive season. 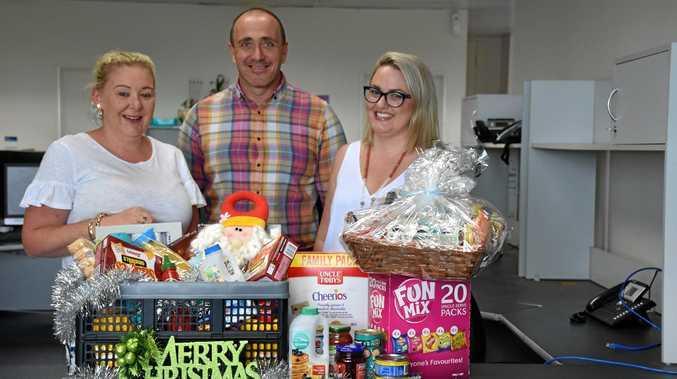 West Moreton Health's Clinical Governance team, which ensures the provision of safe, quality care for people, is again participating in the Queensland Times' Adopt-a-Family campaign to support families in need. Administration officer Kirsty McCoombes said her team was glad to be collecting non-perishable food and supplies that will be donated to two families. "Adopt-a-family has become something of a Christmas tradition for the Clinical Governance team as we have participated for the last couple of years," Ms McCoombes said. "We like to make sure there are a few festive treats in the hamper and we particularly enjoy choosing presents for each of the children. "Come Christmas Day we would really hope that these families get to experience what everyone else wants at Christmas - nice food and company and presents for the kids." Adopt-a-Family appeal coordinator Karen McCoombes thanked the hospital for their support. "It is wonderful that such an important part of our community's fabric has come on board to support the appeal," she said. "Everyone at the hospital help people every day, so to extend their kindness and helpfulness to our appeal is very generous of them. "All of the agencies we team up with constantly tell us how grateful their families are for the support of the paper, and generous people, like those from the Ipswich Hospital."